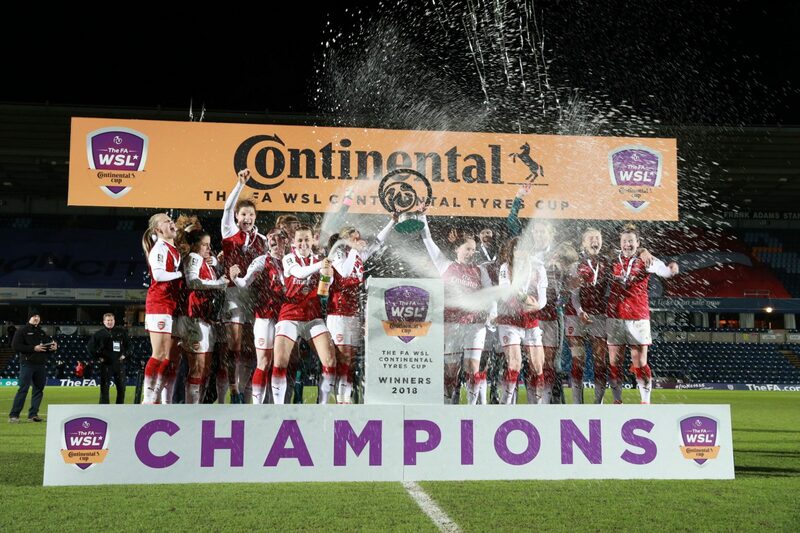 Netherlands striker Vivianne Miedema scored the only goal of the game as Arsenal won the FA WSL Continental Tyres Cup for the fifth time thanks to a 1-0 victory in the final over Manchester City. The result ended City’s hopes of emulating the Gunners’ 2007 quadruple, as their opponents held on at Wycombe’s Adams Park, following Miedama’s first-half effort, to take the trophy back to north London. 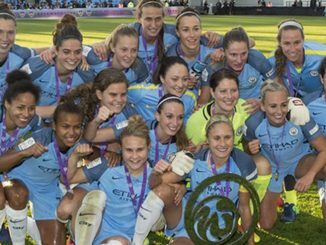 Manchester City piled on the pressure late on and Nikita Parris was denied when her header was cleared off the line by Lisa Evans, but time eventually ran out on the holders’ defence of the trophy. Arsenal came within a whisker of taking the lead after 13 minutes when Dominique Janssen’s stunning first-time effort from 30 yards out crashed back off the bar. Captain Steph Houghton then tried her luck from just as far out with a free kick that dipped just over with chances few and far between in the opening half-hour. Janssen came close again two minutes into the second half with a free kick that went narrowly over before Jill Scott headed a good chance from Jane Ross’ cross straight at Sari van Veenendaal. 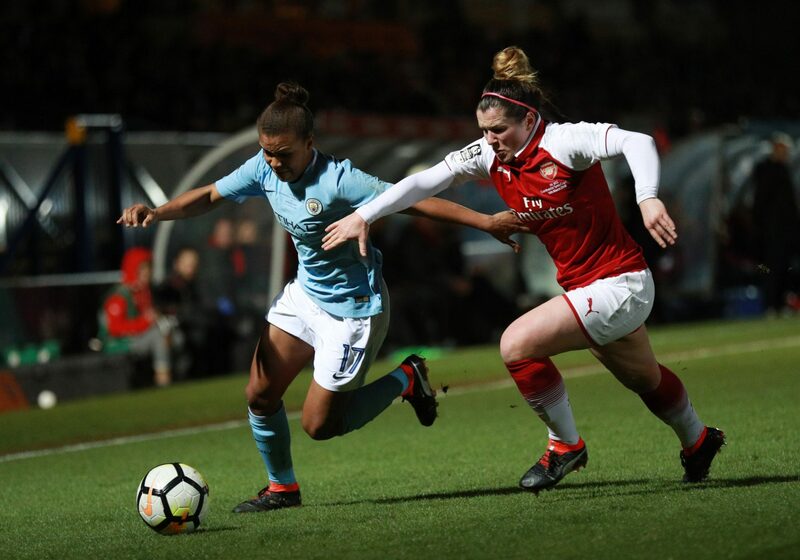 The Arsenal goalkeeper was then given a tougher test, as she had to push away Nikita Parris’ header after substitute Claire Emslie whipped in a dangerous cross. 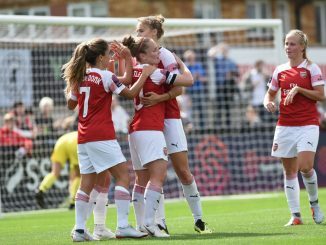 The Gunners made the most of a big opportunity in the 33rd minute when Janssen was played into space by Jordan Nobbs and her cross reached Miedema, who produced a composed finish at the back post. 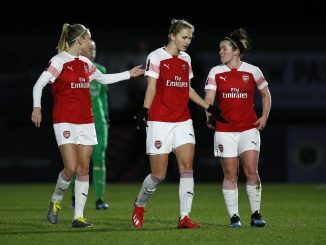 Arsenal’s Kim Little: “I’m just really proud of the girls tonight – we’ve not been together too much lately because of the international break, but I think we executed our game plan really well, particularly in the first half. “I think we dominated the first half, even though we didn’t have too many clear-cut chances, but possession-wise and how we played, I think we were definitely the better team. “They came into it in the second half, which was inevitable, especially with it being a cup final, but we were able to be resilient, which is something we’ve been working on. “We’ve been keeping our focus and our shape towards the end of the game and I’m glad we were able to do it tonight. Man City’s Steph Houghton: “In the first 45 minutes we weren’t at our best and we got punished for that. “I think as the gap between the teams gets a little bit smaller, any little mistake or chance, if the other team takes it, it’s hard to get back into the game. “In the second half, I thought we were the better team and we were camped in their half, but we just couldn’t get the goal that we were looking for. “I just think we were a little bit off it in the first half and it’s hard when you’re playing a team like Arsenal, who like to get the ball down and try and play a similar way to what we play. Both teams are in SSE Women’s FA Cup quarter-final action this weekend, with Arsenal host Charlton Athletic and Man City travelling to Sunderland. Arsenal’s Kim Little said: “We’ve got a home draw in the quarter finals of the FA Cup, which is always nice. It’s good to still be in that cup as well, we’ve still got the chance to win more silverware, so our focus now turns to Charlton on Sunday and putting in a performance then and getting into a semi-final. Man City’s Steph Houghton said: “At this club, we want to try and be the best and that starts again on Sunday, against Sunderland.